Successfully Added Clock Radio With Hidden Pinhole Color Camera Set to your Shopping Cart. Totally undetectable video surveillance in the form of an unsuspecting old-fashioned clock radio. No one will every suspect they are being secretly recorded when using this wireless security clock with powerful 2.4 GHz receiver. That’s because the pinhole video lenses is actually hidden within the “power status” indicator, totally disguising the lens from unsuspecting people, even under close examination. The included 2.4 GHz wireless receiver makes using this system very convenient too. It allows you to remotely monitor and record live video using any TV with a standard “Video IN” connection (yellow RCA). And the picture quality is great, thanks to the full color 1/3 inch image sensor. 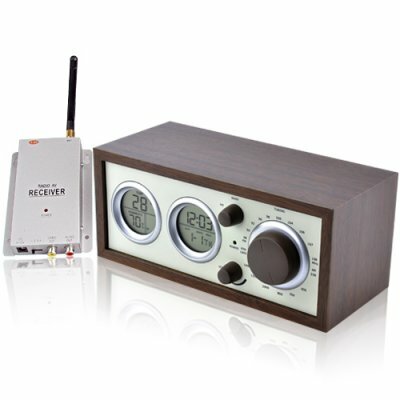 This wireless security system also functions as an AM/FM clock radio with alarm-- and displays the current date, humidity level and temperature! So whether you want to monitor an important office area, or have a little fun in the bedroom, this security system will capture all of the action and without anybody knowing the better! This surveillance system is very easy to operate as well, with no installation required. Order now at our factory direct wholesale price and we’ll ship your order out within 24 hours. And don’t forget, this product is fully backed by our 100% money back guarantee and is in stock now.